1979-1992 represents a period in my life of both personal triumph and heartbreak. These were the years I fine tuned my animation skills and slowly learned how to diversify – not only as an artist, but as a manager and an executive. At times it was a painful process. There are so many more components to creating a successful animated feature film than just the artwork: there’s finance, distribution, merchandising, marketing, and line of product. And that’s not an exhaustive list. My very heart and soul went into crafting a great movie in The Secret of NIMH. Our team worked long, 20 hour workdays to complete the film – only stopping to celebrate when we hit a deadline or had a special screening. All those years of working in Don’s garage on the weekends – learning and mastering our trade – were paying off. Now, while each one of us had our area of gifting and expertise, we shared the role of producer. And Don took the director’s helm, as well as writing, storyboarding, and layout duties. Gary, on the other hand, managed the flow of production, post, sound, music, and color. I was tasked with animation supervision. The creative process was streamlined and suited us well. Don would storyboard, layout scenes and design the characters, and then I would start principal animation on every character – with the exception of Jeremy the crow. The characters in NIMH were fresh and vibrant to us! To me, they represented “us” – the team that left the security of a big studio with a chance of something better...something more. My favorite character to animate in NIMH was and always will be the Great Owl. He was a multilayered character, and it wasn’t until I finished animating him that I realized just how complex he really was. We were fortunate enough to land veteran actor John Carradine, who voiced the character. I’ll never forget seeing Carradine at the recording sessions, and taking note of just how bad his arthritis was. It was very noble of him to commit to our film given his aged, crippled state. When The Secret of NIMH finally hit theaters, it was a critical success – just not a box office one. That was particularly heartbreaking. And, while E.T. ended up reigning at the theaters that year, the ironic thing was that Steven Spielberg turned out to be one of NIMH’s biggest fans. He visited our studio shortly after NIHM’s theatrical run and vowed that–if he could find the right property–he would love to produce an animated feature with us. As we waited for our project with Spielberg to develop, another interesting opportunity came to us – one that I am still associated with to this day. Dragon’s Lair, the first interactive video game of its kind. It was brought to us by electronic game inventor Rick Dyer, and it was an absolute joy to work on. The game ended up being a huge success and was immediately followed by Space Ace and Dragon’s Lair II: Time Warp. Shortly after this, Steven Spielberg finally approached us with the property that would become An American Tail. Production on this film began in 1985 and was completed in 1986. It was a very small budget for a feature film, but we managed to create what we felt was a groundbreaking piece in animation history: It was the first animated film in a long time to be recognized as a major money maker alongside live action box office blockbusters. Our studio began to grow. Several new artists joined us from Canada, along with a huge team of trainee’s from Ireland. Our new CEO, Morris Sullivan, was at work growing our studio and franchise, and Ireland expressed interest in bringing us to Dublin to open an animation studio. It was there where we produced our next film with Spielberg, The Land Before Time. So, after The Land Before Time, we produced All Dogs Go to Heaven, A Troll in Central Park, Rock-A-Doodle, Thumbelina and The Pebble and the Penguin. Much of our American crew wanted to return to America, so Cami and I returned with them to help set up a splinter operating studio in Burbank, California. As the schedules grew more hectic and the splinter studio increased in size, I started to notice that “haunting feeling”… the same feeling that caused me to leave Disney Studios so many years ago. We, Don Bluth Productions, were in a creative rut. What troubled me, though, was the fact that I didn’t care. I believe this resolve came from having worn the producer’s hat for so long and not being able to do what I love: animate. I was burned out, and I longed for escape. And I found that very escape in returning to the art form I abandoned eighteen years before: painting. 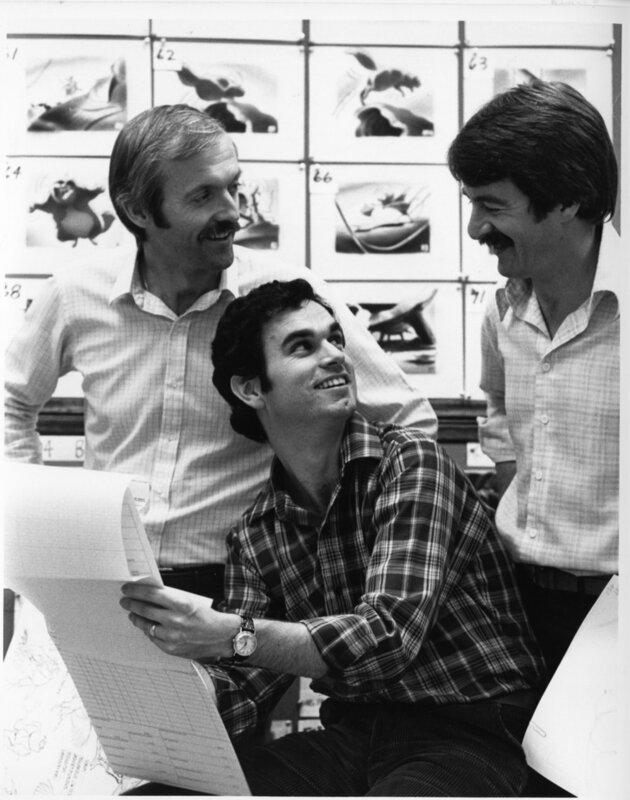 It was about this time that Disney approached me in the form of dear friend and producer Don Hahn. Don had just produced Disney’s Beauty and the Beast. He convinced me to have a meeting with then creative head of Disney Films, Jeffrey Katzenberg. Katzenberg was excited about giving me the character of Captain John Smith in their new animated feature, Pocahontas. It sounded like a great project and a chance to work with a dear colleague and friend, Glen Keane. So, before I even realized it, I found myself returning to Disney Studios.